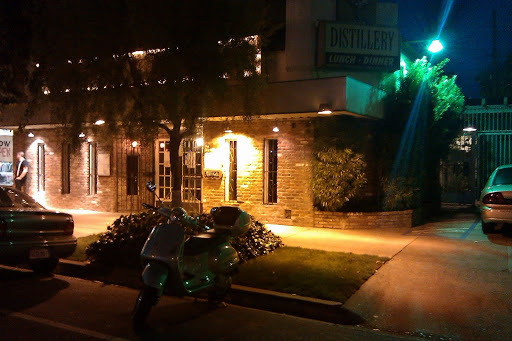 I do not think I would have ever considered a place like The Distillery as having a burger of note, but in a September 5, 2007, article in The Sacramento Bee, Allen Pierlioni picked his top five area burgers with five runners-up, and The Distillery was a runner-up. I am sure you noticed the date; I kept the article, but never got around to checking this place out until now. I guess I did not believe the writer back then: the Squeeze Inn and Scott’s Burger Shack were nowhere to be found out of the ten and Ford’s was in there (back when Ford’s was awful), so the guy must have been crazy. On second thought, it may have been the closest place to the newspaper office to get a burger and the writer may have been a little biased. Anyway, times have changed since 2007 and I am sure Mr. Pierlioni would not place this restaurant’s burger offerings in the top ten with so many new and exciting burger joints and restaurants that offer promising burgers. I may have shunned the restaurant for these reasons and also the fact that I walked into the place some years ago and it seemed like a dive — with its yellow-tinted lights, tacky wallpaper, and cheap wall hangings. 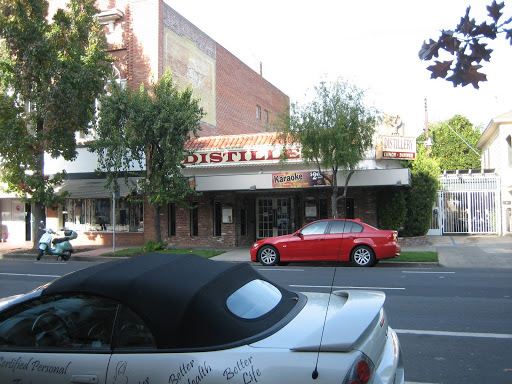 When I walked into the place about six years after I first poked my head in, it looked like it had not changed. Eek! Just then, a young man came out of the kitchen and seated me. He served my iced tea with an iced tea spoon in it and two large slices of lemon. (I have not seen an iced tea spoon in years!) After noting that the tea tasted like what I imagine battery acid might be, I squeezed the hell out of the two mega-chunks of lemon mounted on the glass and employed the spoon to add sugar to the drink — something I haven’t done since — well, since I last saw an iced tea spoon. area only added to the problem. Check out the iced tea spoon! ﻿﻿﻿﻿﻿ Now the drink was tolerable. I ordered the Bacon Cheeseburger over the cackles of the bartender. 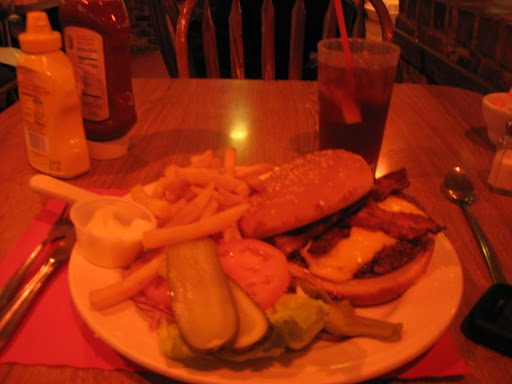 The Distillery’s Bacon Cheeseburger is ½ lb. of ground chuck with enough iceberg lettuce to sink the Titanic, two tractor tire-size slices of tomato, two sandwich-size slices of pickles, and a surprisingly thin slice of red onion on a very large bun. Decorum would dictate I cut this down some, but as my wife will attest, I never was much for doing something so genteel when it comes to eating. If the hamburger was delivered with this stuff, then it was meant to be eaten that way. The hamburger is huge, if not very inspiring. Still, the patty is high quality, even if the rest of the elements are pedestrian. When I was finished, my jaw was sore from all the stretching. I can see someone wanting to give The Distillery a nod for making such an awesome burger. (Be advised, all you who have slaughtered the definition of said word: I mean “awesome” as in a really high mountain or a really deep sink hole — not something that would have anything to do with how something tastes.) The Bacon Cheeseburger is served with boring, but not bad, fries — they are too thick to be called steak fries, but not crispy enough to be called good — or awesome, if you must. An earlier shot of my wheels (before I removed the fly screen) and the restaurant.